Like Cupid’s arrow through the heart, Karen Walker Eyewear strikes us down this season. Since the New Zealand based designer first introduced sunglasses over a decade ago, her one of kind frames have always been instantly recognizable from a mile away. This is without any overt logos or branding, just a simple arrow adorning each temple. And If you didn’t notice the arrows before, don’t worry, you surely will now! As Karen Walker’s iconic arrow is the star of this season’s campaign and collection. Karen explains “The arrow stands for the brand’s optimistic spirit, élan and fearlessness…Our campaigns are always about the fun side of wearing sunglasses and this campaign is about the Karen Walker effect you experience when you’re wearing a pair of glasses with an arrow on the temple,” To further that point, she disclosed that the only direction given to this season’s model was “to be delirious.” No doubt, a natural side effect to wearing one of her gorgeous pairs of sunglasses. 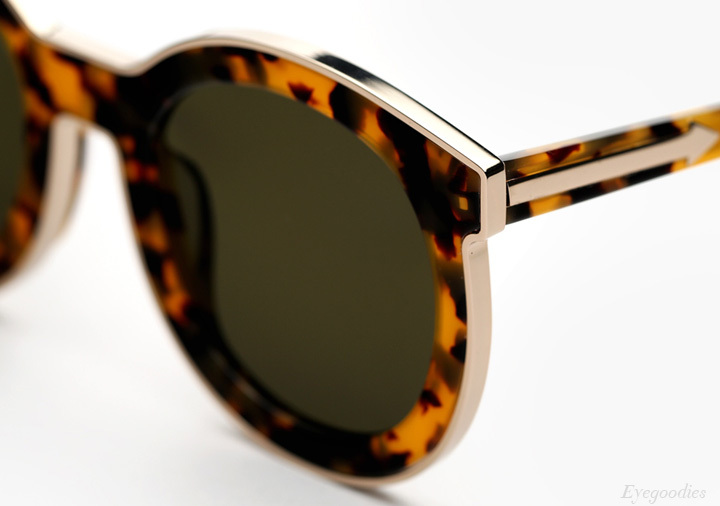 Fans of the brand will notice a mash-up of familiar shapes, however in true Karen Walker fashion, the end result are sunglasses which are completely unique. The styles are reinvented in new colorways of rose pink and soft grey, as well as Karen Walker’s staple crazy tortoise and classic black. Acetate frames feature gold, silver and rose gold metal detail, offset by champagne and silver mirror lenses.